It’s funny. It was just last week that I went on a mini-rant about the seemingly endless wave of social network aggregators we’ve been seeing. Maybe I was just sick of programs that had a lot of potential but didn’t do much to set themselves apart. Because after spending an evening with the newest version of Yoono, I’m quite ready to come out as a full-fledged hypocrite. I think I’ve found a social network aggregator plugin I might actually use. Yoono’s main draw at this point is its “Friends” widget, which offers all the features you’d expect from a social network aggregator. The widget compiles all updates from Twitter, Facebook, Piczo, Flickr, and Friendfeed, and displays them in a scrollable list. After clicking a person’s name, you are presented with direct links to their profiles, photo albums, or messaging pages, which cuts out a lot of tedious navigation. 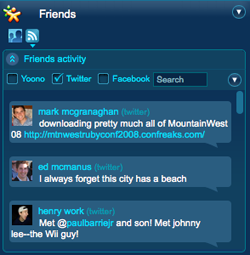 The widget also features integration with most of the major chat clients (AIM, MSN, etc), along with the ability to send out status updates to any profile. So far, so good (though pretty standard). What really sets Yoono apart is its slick UI. As you browse through your list of friends, you can mouse-over any contact to get a popup summary of their latest profile and status updates. Hover over any of the thumbnail sized photos shown in the widget, and you’ll see a full-sized version overlayed across your browser, all without ever leaving the page you were browsing. Besides “Friends”, Yoono offers five other widgets that can be added and removed at will. The most useful is “Discoveries”, a carryover from Yoono’s original incarnation that we’ve described as a mix of StumbleUpon and del.icio.us. The widget analyzes the pages you visit and presents a number of relevant tags and related sites, along with a list of Yoono users who share similar interests. 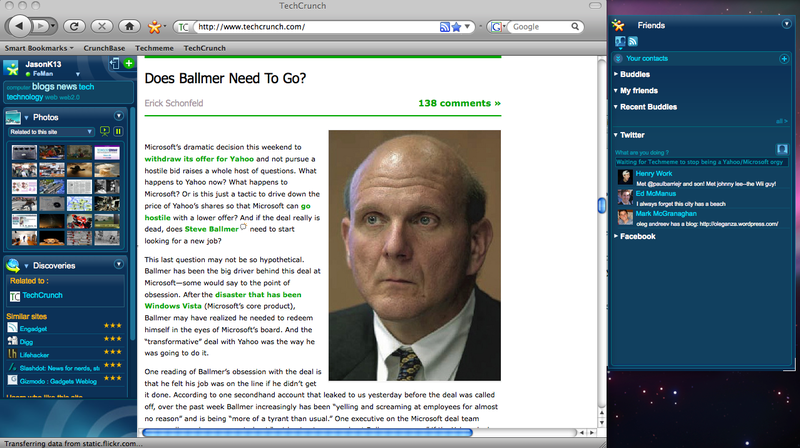 “Web Notes” acts as a rudimentary collaboration tool that lets you drag images, text, and video into the side bar for future reference or sharing with friends. The rest of the widgets are media oriented, and are significantly less polished. “Photos” allows you to browse Flickr images relevant to the page you’re read, while “Videos” lets you browse through YouTube. If Yoono has one major fault, it’s that it has too much to offer and not enough space to do it in. Navigating the Friends list within the sidebar is difficult if you’ve got any other widgets open – there just isn’t enough room. Each widget can be broken off of the sidebar into a separate window, but this is only useful if you’ve got some extra space on your screen (and you could just as easily use a desktop client in this case). Yoono is going to draw a lot of (apt) comparisons to Flock, but as a plugin it might be able to target a bigger market. Yoono is currently available in private beta for Firefox, with an IE version on the way. For those looking to try it out, we’ve got 500 beta invites, which can you can grab here.